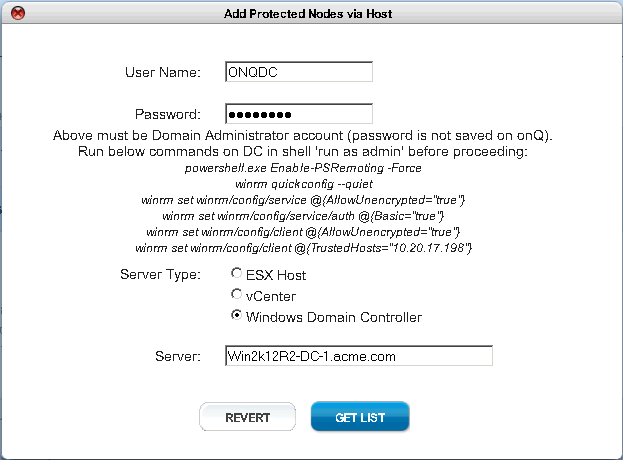 (Agent‑based Centralized PNs) Enroll protected nodes (Windows Remote Management) commands that appear in the dialog. These commands enable the onQ Portal to retrieve a list of PNs registered with the Domain Controller and authorizes onQ to install packages on the PNs that you specify. After enrollment, you can disable winrm. For specific instructions, contact Quorum Support. The onQ Portal retrieves a list of machines from Active Directory, then displays the inventory. You’re now ready to enroll them. Proceed to the next step. a. Select the check boxes (or ALL button) for the PNs that you want to enroll. If a host does not appear in the list, make sure that (1) it is joined to the domain that you specified, and (2) its operating system is supported (see Centralized Enrollment Support). If a host appears, but is greyed out, it’s already enrolled on this onQ. If you want to enroll a previously enrolled agent‑based PN on a different onQ using Centralized Enrollment, you must first delete the certificate on that PN; for instructions, go to Create secure connection to PNs. b.	Click Enroll to push the onQ Service to the PNs that you specified. 6. (Optional) Make global changes to the node configuration parameters. You can always customize these parameters after enrollment. 7. Verify enrollment. If onQ is unable to enroll a PN or the DC, see (Centralized Enrollment) Protected Node Enrollment Problems. 8. Activate the PNs. Go to PROTECTION CONFIG tab > MODIFY button > SAVE button.